Ruth Roberts Griswold Oil Portrait from the collections of the Worthington Historical Society (WHS) may be used for educational purposes as long as it is not altered in any way and proper credit is given: "Courtesy of the Worthington Historical Society, Worthington, OH." Prior written permission of the WHS is required for any other use of Ruth Roberts Griswold Oil Portrait. Contact WHS at info@worthingtonhistory.org to request permission. Ruth Roberts Griswold Oil Portrait is an art original, with genre portraits. Its dimensions are 22 in. 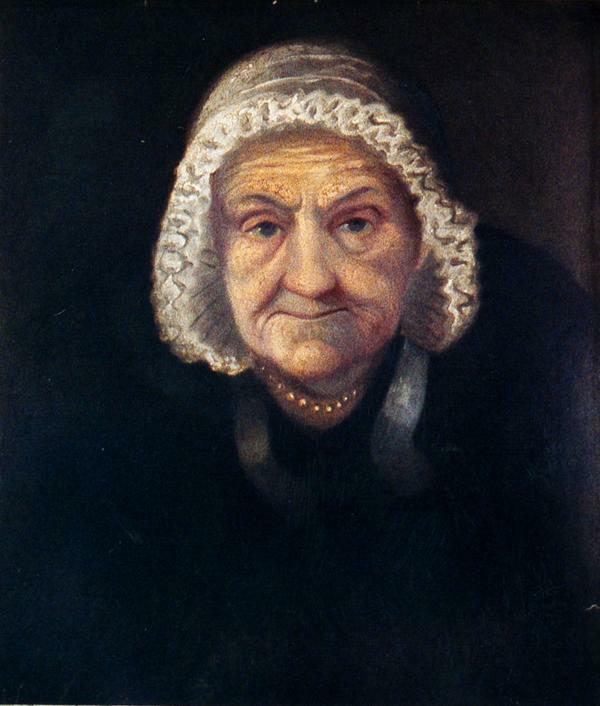 x 24.75 in..
Ruth Roberts Griswold (b. Jan 24, 1768 d. May 31, 1847) is shown in this oil portrait, painted by an itinerant artist about 1840. She was the wife of Ezra Griswold, Scioto Company proprietor. Mother of twelve children, she was an active partner in the family's many business ventures. She is shown wearing a muslin cap. This style was popular during the 1810-1830's. Women wore hats or caps all the time. Straw and felt hats were worn outdoors, while caps of muslin or linen were worn indoors or while working. Itinerant artists traveled through frontier, doing portraits in pencil, oil or in silhouette. Having a portrait done was indicative of the family's economic and social rise. It features the person Ruth Griswold, 1768-1847. The Worthington Memory identification code is whs0788.